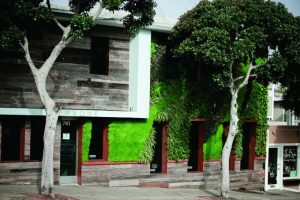 A Laguna Beach landscape architect is painting the town green with vertical gardens that beautify, enchant and, most of all, show that art comes in many different forms. Laguna Beach is a mecca for some of the country’s finest artists—every summer there is, of course, the renowned Festival of Arts, showcasing paintings, sculptures, photography and more; Pageant of the Masters, a world-famous living pictures show; Sawdust Art Festival, exhibiting handcrafted items from local artists; Laguna Art-A-Fair, with U.S. and international exhibitors; and a slew of year-round galleries, to boot. Yet, plants as a medium for magnificent artwork don’t immediately come to mind. But passersby who have seen the large “living wall,” or vertical garden, in the parking lot of Obagi Skin Health Institute on South Coast Highway might think differently. The piece is massive, requiring you to take several steps back to really evaluate its full impact. Playing with scale, form and swirls of purple and green, it is a beautiful and brilliantly executed living, growing work of art. 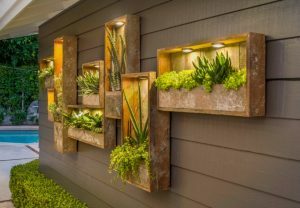 This is just one masterpiece that can be seen around town from landscape architect Scott Hutcheon and his Laguna Beach-based firm, Seasons Natural Engineering, which is one of the nation’s top businesses that produce vertical gardens for commercial and residential spaces. 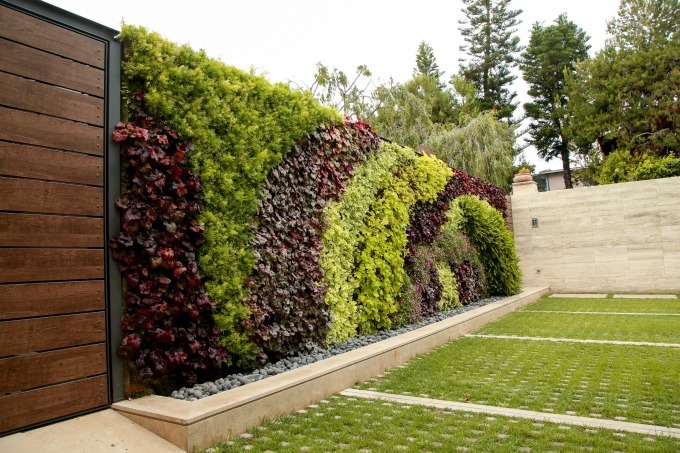 As the living wall movement has boomed over the past decade due to the trend of incorporating eco-friendly and sustainable design, once-plain walls are given new life thanks to companies like Hutcheon’s. 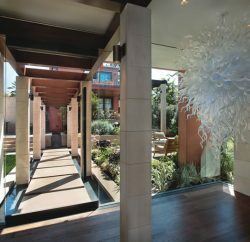 With the drought in mind, Hutcheon employs recirculating water systems, as well as drought-tolerant plants that not only lend themselves to sustainability but beauty, too. 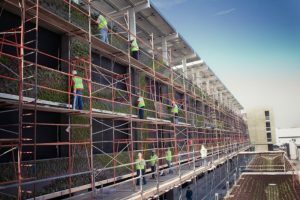 Crews create a living wall on the Edwards Lifesciences parking structure in Irvine. While the type of vertical gardening system is important, so are the shrubs that go in them. Hutcheon is always rethinking the plants he uses, looking out for stronger performers while taking away fussier, low-performing specimens. 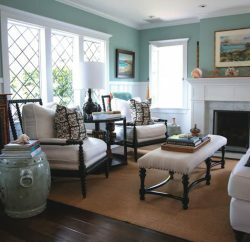 Ferns are among the plants used by Hutcheon; some of his favorite types, appreciated for their graceful textures and durability, are sword, lemon button, bird’s nest, kangaroo, jester’s crown and asparagus fern. Other preferred plants include coral bells (a type of perennial) due to their many colors and succulents like heartleaf ice plant and hens and chicks (also commonly called houseleeks). He must be on alert for changing conditions; a downy mildew that recently afflicted the red apple variety of Aptenia (a type of ice plant) in Southern California has forced Hutcheon to change out the stricken species with something else. 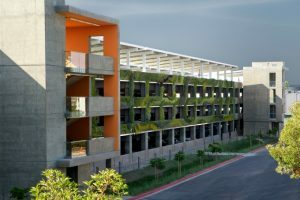 As completed, the hydroponic living wall on the Edwards Lifesciences parking structure is one of the largest in North America. 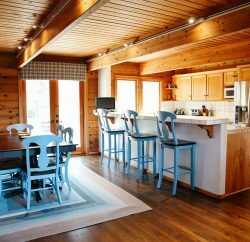 With these tips, you’ll have a green thumb in no time.